Conakrian was built in 1937 and served extensively during WW2 undertaking many independent voyages and taking part in a number of convoys. Surviving attacks by both aerial mine and torpedo, she lived on to continue her service life until 1968 when she was broken up. Registered owners, managers and operators Owners: Elmina Ltd. Managed by: United Africa Co Ltd.
Builders Furness Steam Boat Co. Ltd. Engines Triple expansion steam engine with cylinders of bore 23", 38" and 65" with stroke 45". Engine builders N.E Marine Engineering Co. Ltd.
1959 Sold to Pan-Norse Steamship Co. S.A. (Managed by Wallem & Co.Hong Kong and registered in Panama. Name changed to Southern Mariner. I have found no specific information about the service history of Conakrian before WW2. Conankrian took part in many convoys and a large number of independent voyages during WW2 according to information shown in the table below which is provided courtesy of Convoyweb - see External. Ref. #4. There is a brief account by Stan Mayes who spent a short time on her after she had been mined on the Benjidog Recollections website HERE. On 20 October 1940 the destroyer H.M.S. Cleveland left Kirkwall with British steamer Ben My Chree and they arrived at Aberdeen at 14:00. The destroyer then escorted Submarine L-23 from Dundee to Scapa Flow and en route assisted damaged British steamer Conakrian and rescued survivors. Conakrian had been torpedoed in an air attack off Girdleness. At 21.14 hours on 31 Oct, 1943, the unescorted New Columbia (Master Frederick Bradley Kent) was hit in the foreship by one FAT torpedo from U-68 southwest of Bingerville, Ivory Coast. She sank by the bow after being hit in the engine room by a second FAT torpedo at 21.44 hours. The master, 54 crew members, ten gunners and 19 Kroomen - alternatively known as Kroumen or Krumen (African sailors who had been taken on as crew) were picked up by the British merchant Conakrian and landed at Lagos. Lauzemis thought after he had questioned the crew that he had sunk the Troilus. New Columbia was on a passage from Libreville to Lagos with a general cargo and copper when she was sunk. Remarkably, no lives were lost. 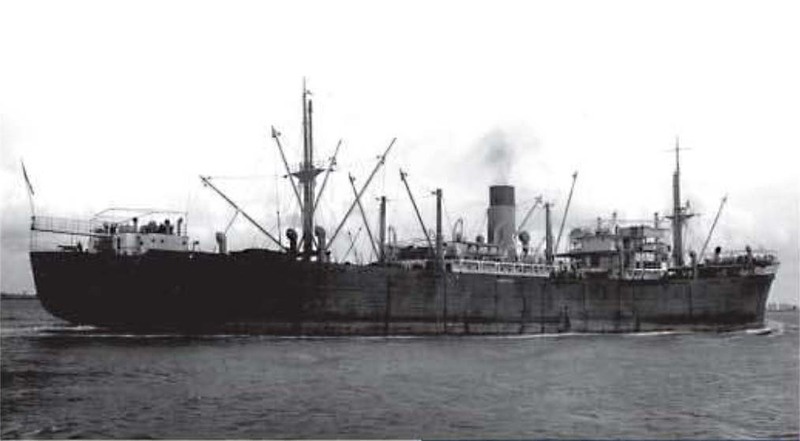 Conakrian struck a mine in the English Channel on 15 April 1944 whilst in convoy ATM 125 which departed Antwerp for London. She was heavily damaged when the mine exploded below #4 hold. Luckily there were no casualties and the ship survived to be towed to Tilbury Docks where her cargo was discharged. Stan Mayes states that she was then laid up until 18th June 1945 when he joined her with a 'run crew' with the intention of her being towed to the Tyne for repair. However off Southend we received orders to anchor the ship which we did and a few days later we - the 'run crew' left the ship - only some officers and engineers remained. Conakrian remained at anchor off Southend until 23rd December 1945 and then left under tow for the Tyne, arriving Christmas Day. 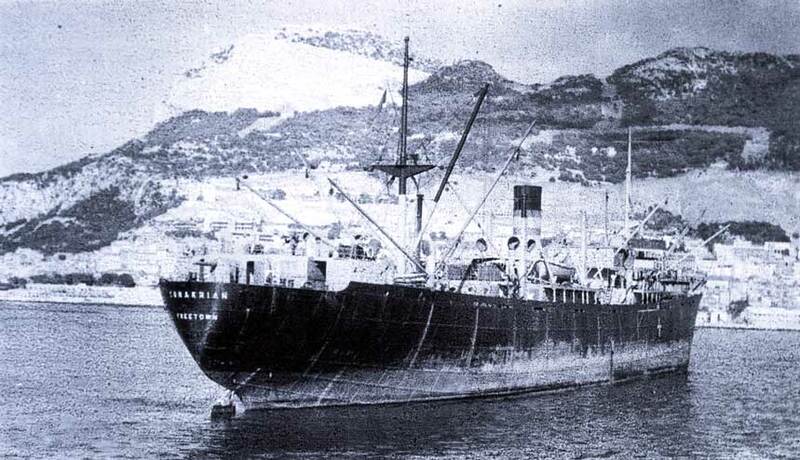 In 1949 Conakrian was sold to Palm Line and renamed Dahomey Palm. Palm Line transported palm oil from West Africa for use by Unilever, initially famous for soap and margarine production. The palm oil required for the soap making process was shipped from West African ports to the Liverpool area. In 1959 she was sold again to Pan-Norse Steamship Co. and her name changed to Southern Mariner. This company was based in Panama but there is currently no information on how she was used. After another change of ownership in 1963, her service continued until September 1968 when she was take to be broken up in Hong Kong.